An essential element of equipment and system design, computer aided design (CAD) is commonly used to simulate potential engineering problems in order to help gauge the magnitude of their effects. Useful for producing 3D models or drawings with the selection of predefined objects, Computer Aided Design: A Conceptual Approach directs readers on how to effectively use CAD to enhance the process and produce faster designs with greater accuracy. This handy guide provides practical examples based on different CAD systems, and incorporates automation, mechanism, and customization guidelines, as well as other outputs of CAD in the design process. It explains the mathematical tools used in related operations and covers general topics relevant to any CAD program. 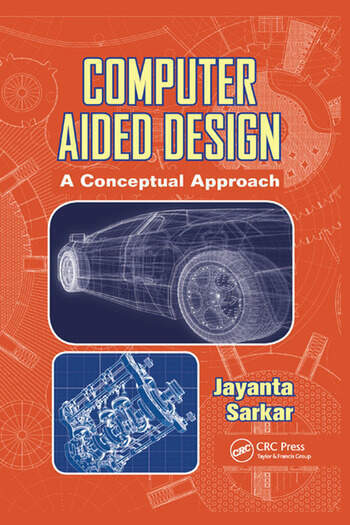 Computer Aided Design: A Conceptual Approach concentrates on concept generation, functions as a tutorial for learning any CAD software, and was written with mechanical engineering professionals and post-graduate engineering students in mind. Jayanta Sarkar works as an assistant manager in the Heat Exchanger Division of Paharpur Cooling Towers Limited, Kolkata, West Bengal, India. He manages the day-to-day engineering design activity of various industrial products related to power plants using various advanced CAD software and FEA packages, and has expertise in piping and pressure vessel design, and design and development of mechanical systems. Sarkar received a degree from the A.M.I.E. Institute of Engineers (India); a diploma in mechanical engineering from Murshidabad Institute of Technology, West Bengal, India; and a post-diploma in advance tool design from Central Tool Room and Training Center, Kolkata, India.